ENVIRONMENTALLY friendly, safe, humane, and deadly efficient - that’s Radar, a new generation in rodent control, developed by Rentokil Pest Control . The Radar unit has been developed in the United Kingdom by its parent company for use in 'high risk' areas, such as food processing plants, computer sites and pharmaceutical manufacturers where it is critical to control the risk of rodent damage or contamination of product. Rentokil general manager David Peterson said Radar was ideal for mouse control in areas where conventional baiting was not allowed, as it used a 'green' pesticide to deal with mice rapidly and humanely. The unit consists of a chamber through which the mice can run. They pass over a pressure sensitive pad which closes the chamber doors and triggers a spray of carbon dioxide to gas the mouse. 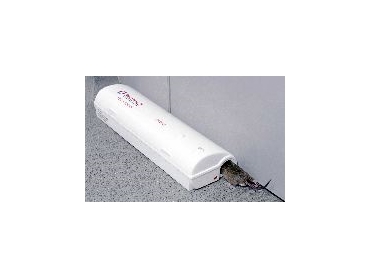 A flashing LED then alerts the customer that a mouse has been caught. "Radar is a great advancement on from our Mouse Monitoring Unit which uses the sensor pad to alert us to the presence of mice,” Mr Peterson said. “Now we can safely remove the pests without any potential for rodenticide contamination, or possible contamination from dead mice." The carbon dioxide gas is used in such small quantities that any remaining gas dissipates away without any detectable increase in CO2 in the atmosphere around the Radar unit. * Gives an effective 'early warning' system for detection and immediate removal of rodents. * Uses a "green" pesticide solution that works effectively, rapidly and humanely. * Eliminates the risk of product contamination from rodenticide baits or dead rodents. * Enables rodent control in high-risk areas where conventional baiting is not allowed. * Allows Rentokil Pest Control staff to service the unit with minimal client disruption.